First, we are committed to getting maximum compensation for each of our clients in personal injury and workers' compensation cases. Second, we are committed to furthering the laws that apply to these cases and the way that these cases are handled. We strive to create an environment in which people who are hurt at work or injured due to an act of negligence do not have to struggle to get by. 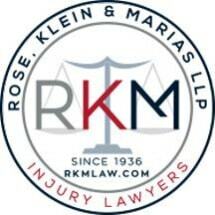 The history of Rose, Klein & Marias began in 1936, when attorney Victor C. Rose began practicing law in Los Angeles. Four years later, he was joined by Alfred M. Klein. In 1946, Eugene Marias joined the team. In the decades since, the firm has expanded to include dozens of experienced lawyers. We now have ten locations to conveniently serve all of Southern California. Although we have grown, our dedication to helping our clients hasn't changed. This dedication is what has allowed us to thrive. We are driven to succeed. Our law firm is focused on two areas of practice: workers' compensation and personal injury. These are the matters we have devoted our careers to. These are the cases we care about. Our focus means that we have the depth of knowledge to help our clients get results. We take pride in the fact that attorneys from our firm have spearheaded many of the types of cases we handle. In 1975, we were the first law office in California to bring a lawsuit against asbestos manufacturers for damage done by their product. Throughout the years, we have broken new ground in numerous types of personal injury and workers' comp cases. Our team is made up of leaders. Among our lawyers are past presidents of the California Applicants' Attorneys Association (CAAA) and the Consumer Attorneys of California (CAOC). Our peers, as well as our future peers, turn to us to learn about the law. In addition to giving seminars on various topics, our law firm has a 45-year history of educating the lawyers of the future at the University of Southern California (USC) and the University of California - Los Angeles (UCLA). While our history is filled with many accomplishments, the one we want to discuss with you is one we have yet to achieve: getting you the compensation you need to move forward with your life. Let us show you how we will achieve it. Want a Free Consultation? The best way is to Contact us today to schedule a free consultation about any personal injury or workers' compensation case, from auto accidents to repetitive motion injuries.